Having always wanted to do a Colour Run, I leapt at the chance to take part in the one that came to Lincoln. The Student Colour Run Lincoln combined a festival-like atmosphere with a 5k run around the uni campus – sounds like fun, right? Well, I can tell you that it most definitely was! It almost makes me feel sorry for anyone who missed out on the opportunity to get covered in paint and have a laugh with their friends! "Colours are the smiles of nature"? 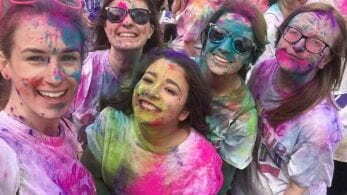 Colour festivals originated from the Hindu colour festival of Holi, which is celebrated annually in the springtime to honour the start of a new season. Having originally been a celebration of fertility and the harvest from as early as the 7th century, the festival has grown into a worldwide celebration of life, happiness and colour. On the day after the full moon in February/March, people of different ages, classes, genders and castes gather together to dance, sing, throw paint and have fun in ‘The Festival of Colours’. Traditionally, Holi is also about equality and hopes to break down barriers between different hierarchies. The festival aims to achieve this by proving that these differences don’t matter when you’re covered in paint and having fun. Also known as ‘The Festival of Sharing Love’, it encourages role reversal of genders and status hoping that stereotypes can gradually be reduced and removed. Student Colour Run Lincoln 2017? Whether you’re looking to travel further afield and make your colour adventure into a holiday or just have a day out near you, I’ve found some of the best ways to get your colour fix this summer – and maybe some with a twist!